Anti-wind turbine protestors are launching a barrage balloon on Friday to demonstrate the height of turbines planned for Devon. 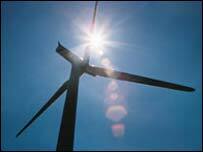 Renewable Energy Systems (RES) wants to install between 10 and 19 wind turbines near North Tawton. The Den Brook Valley Action Group is to fly a balloon at the height of the highest turbine, 100m (328ft). RES says it has already held four exhibitions in the area to show people how the scheme will look. The balloon will fly from Friday until 2 May subject to weather conditions. The balloon launch is supported by the Dartmoor Preservation Association which also opposes the building of a wind farm at the site. Phil Hancock of the Den Brook Valley Action Group said: "If you are able to see our balloon you will be able to see the wind turbines if they are built." The balloon will be elevated on Friday at 1100 BST at a spot as near to the site of the proposed wind turbines as possible. Councillor Bill Cann, chairman of the Dartmoor National Park Authority, will verify the height.